Direct Security Marketing Ltd was a relatively new company, only having been formed 8 months before the offence was committed. It’s quite likely that the Director was simply ignorant of the laws surrounding the marketing methods he was using. Unfortunately, as they say, ignorance is no excuse. Never organise a broadcast in the early hours of the morning, you’ll just be asking for complaints and use some common sense, regardless of your logic, no one wants to receive any kind of sales or marketing call at 1am! Make sure you understand your obligations under the Privacy and Electronic Communications (EC Directive) Regulations 2003 (“PECR”) ). PECR affects things like texting, automated voice and email. When you make calls, ensure that you show your CLI. If you don’t, your calls can still be traced. In order to make automated calls, under PECR, you need consent from the recipients to receiving automated calls. 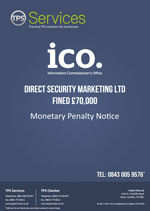 Direct Security Marketing Ltd and its company director Antonio Pardo were prosecuted at Dudley Magistrates’ Court for failing to notify the Information Commissioners Office (ICO) that the company was handling data. The director was also prosecuted for being negligent in the company committing the offence. It costs £35 to register your company with the ICO. Being registered does not ‘prove’ anything and the ICO does not monitor who is or is not registered. However, if your business is holding data on individuals then your business needs to register and failure to do so is a criminal offence. If your business comes to the attention of the ICO and you’ve failed to register, you can expect an investigation and a possible conviction. Direct Security Marketing Ltd pleaded guilty to a s17 non-notification offence and was fined £650, ordered to pay costs of £492.78 and a £65 victim surcharge. The company’s sole director, Antonio Pardo, pleaded guilty connivance or neglect of a senior officer of the company. He was fined £534, ordered to pay £489.08 costs and a £53 victim surcharge.